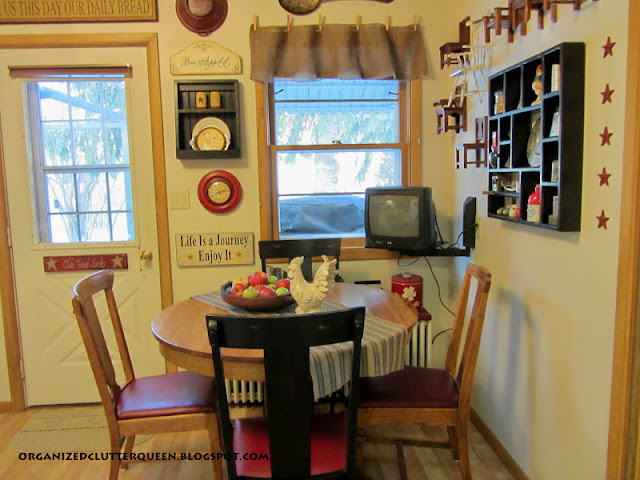 I have shown you bits and pieces of my kitchen in previous posts, my easy burlap curtain valance, my re-painted shadow box, revamping the corner built in, and the Christmas Tour. 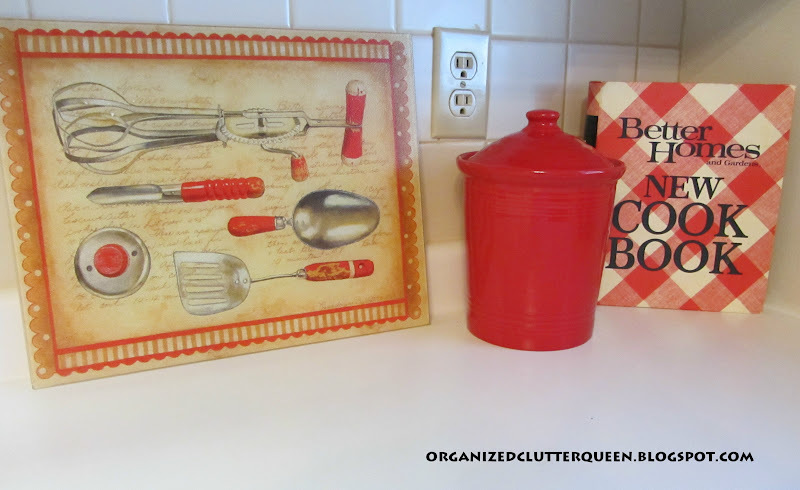 This post will reveal the rest of kitchen as it was February 14, 2012, Valentine's Day. It may change tomorrow! 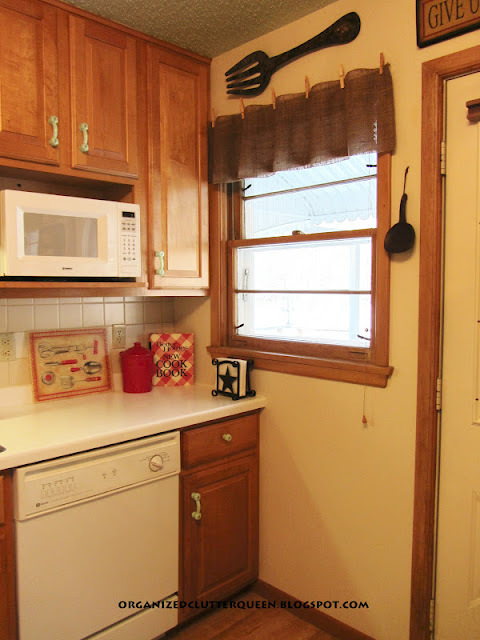 I have a small, square, eat-in kitchen with a door to the outside deck. Luckily, the room next to my small kitchen is a laundry room with lots of built in cabinets for groceries, small appliances and other kitchen necessities. So how would I decorate a small kitchen here at Organized Clutter? I would use almost every inch of wall space to display my stuff. It's not for everyone, but it's for me! Here is my eating area. I have an antique oak, pedestal table and four chairs. Two of the chairs are painted black and distressed. The other two are similar but not matching. As you can see we watch TV at the table. I love chairs on the wall too. This is the only radiator in my house, the rest of the rooms have cast iron baseboard heat. I had a shelf made for collectibles, vintage jars, cannister, lard pail, graniteware coffeepot and toaster. The shelf is partially hidden by the table, but I know what's there. This is my tabletop. 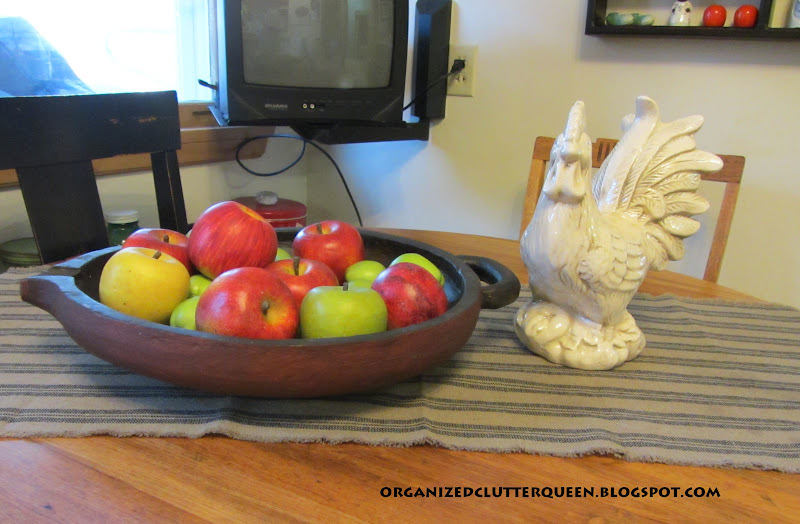 It has apples in the treenware reproduction bowl now, but I like to change it seasonally. This is a built in corner shelf in my kitchen. I also change this up. 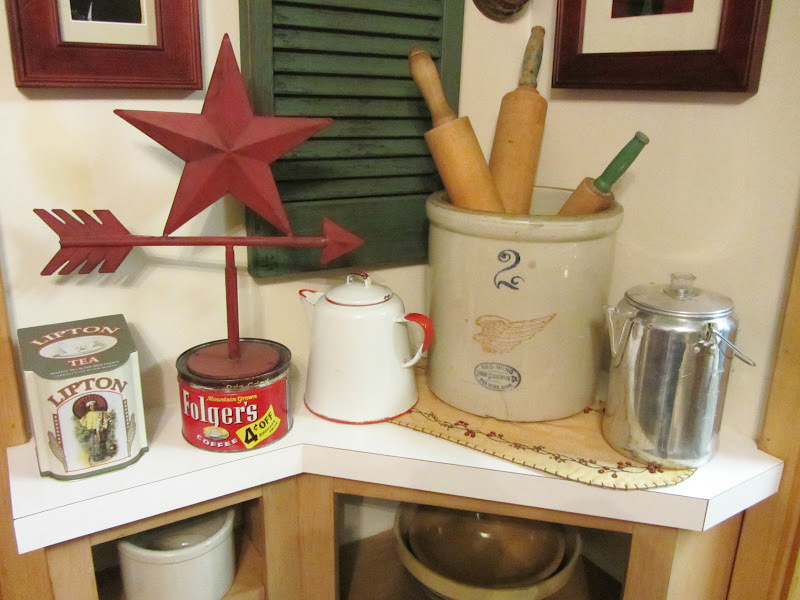 More kitchen collectibles, vintage coffeepots, crocks, and rolling pins. And below, small crocks and yelloware bowls. 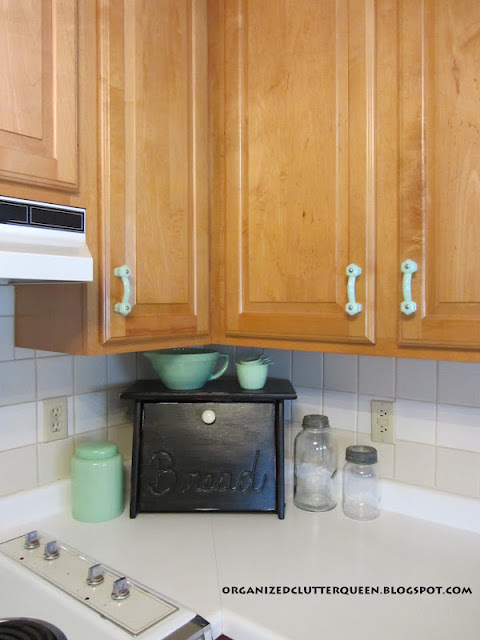 I have reproduction jadeite door pulls on my cabinets and white formica countertops. 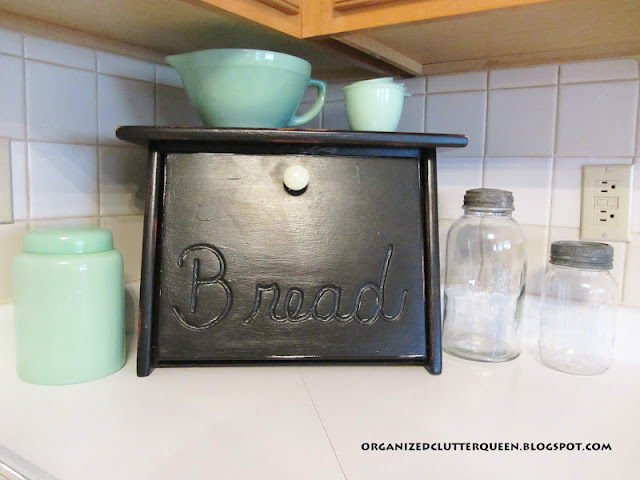 This is a bread box that I have had in three different colors, stain, red and now black. This is a small shelf over my sink. I just put the wooden utensils in the pitcher after I saw Pottery Barn do it in a similar pitcher with two stripes. This is the other side of my sink. I have red fiestaware dishes. 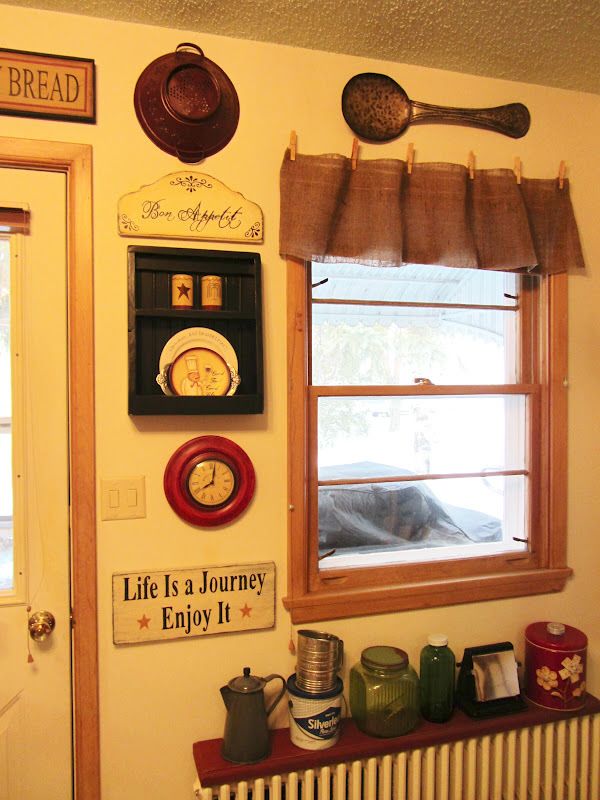 Here are my burlap curtains hanging by clothespins. 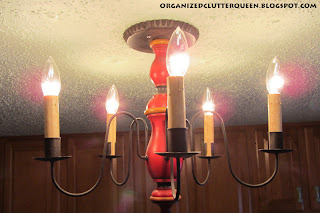 Here is my red, black and mustard, flush mount Lt Moses light fixture. This is my only room with a popcorn ceiling, done with the kitchen remodel of 1990. The ceiling is painted green to match the cabinet handles. This is my kitchen from the laundry room door. I used to have signs over the windows too but I found the large spoon and fork and liked them better. I love to hang signs over doorways. They are usually a perfect fit. I have a vinyl "hardwood" floor, it works well with two little dogs that like to spill their water. The cabinets and trim are a light wood stain, and the walls are painted an almond color like the tiled backsplash in white and almond. 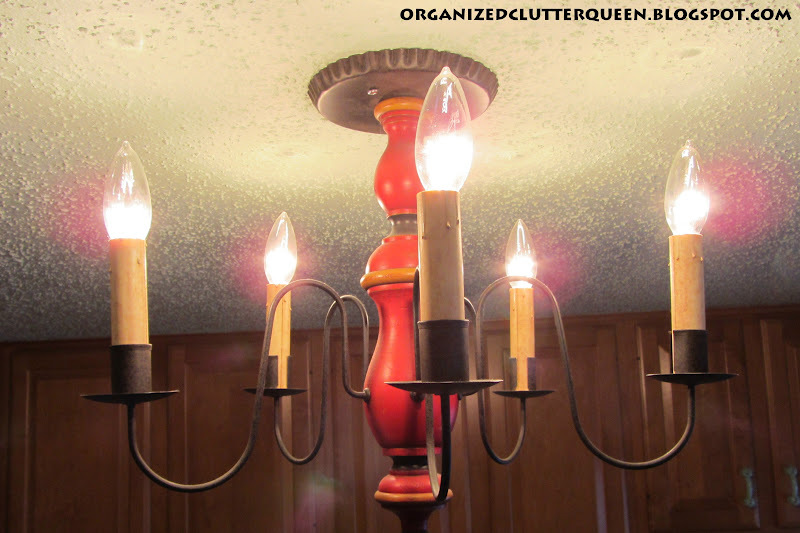 Nothing fancy, but it works with Organized Clutter! Very pretty area! Love your collections too! Especially the yellow ware!! 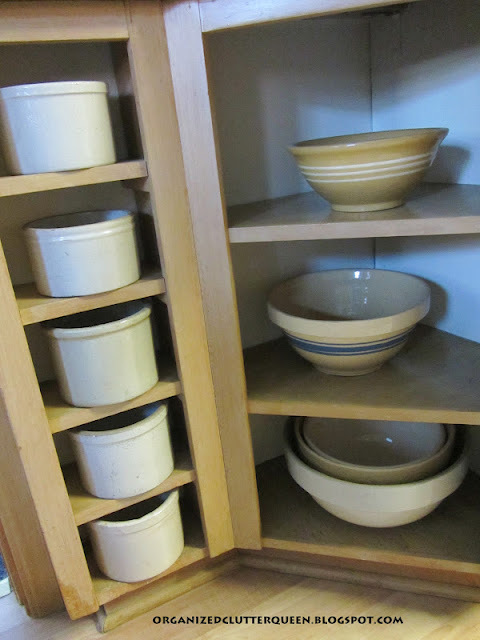 Very cozy kitchen Carlene.. love your bowls and collections too! Love your kitchen and eating nook. I especially like all your collections and the handles on your cabinets. Visiting from Sunday's Best. 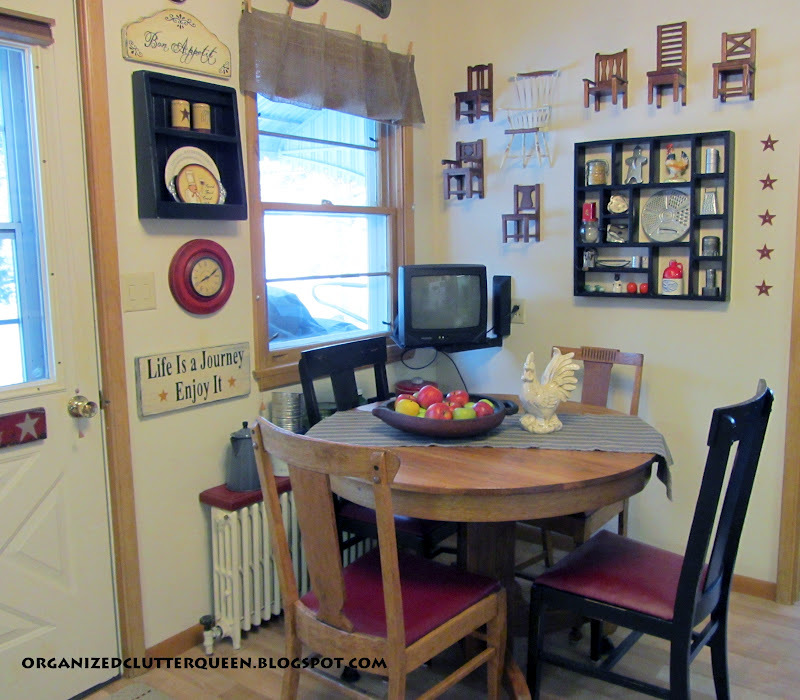 Your kitchen nook is so cute - love the mismatched chairs, and chairs hanging on the walls. Great colors and wall groupings. Thanks for sharing your creative inspiration at Sunday's Best. 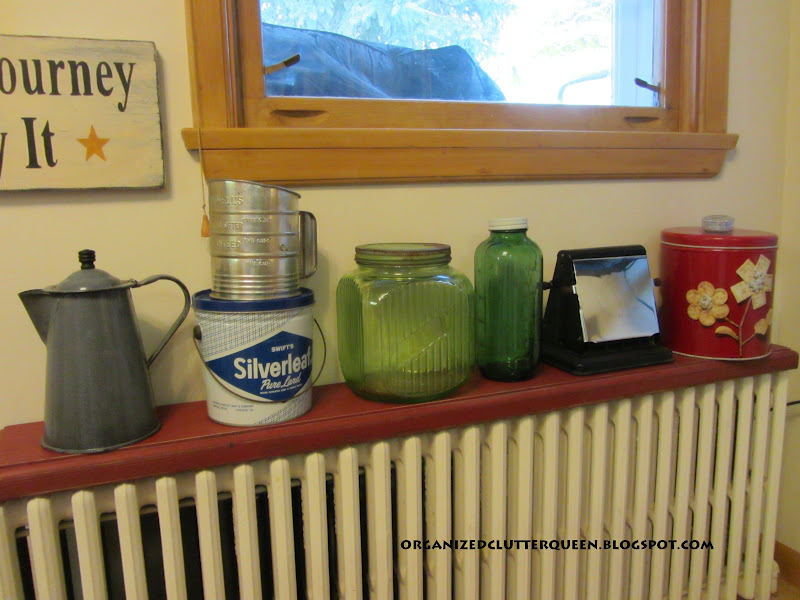 Love your fiestaware canister - I have fiestaware (all different colors) and I've been wanting to save up to get a set of canisters but I've just had too many things pop up stopping me from doing it. Also, I forgot to mention - starting next Monday I will be having a "Get Inspired Monday" party every week. 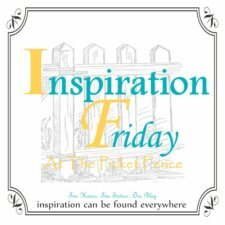 You are invited to come by and link up any of your projects! What a sweet dining nook! It reminds me so much of a favorite cozy restaurant in an apple orchard village we visited often when I was a kid. So many adorable items to look at!! I think everything looks great! I love your kitchen and all the pretty and cozy decorations, such wonderful elements you have! Have a happy week. Your Kitchen is just so charming!! Love everything that you have displayed! I have no bare walls either!! LOL! I am in love with the chairs on the wall. They look AWESOME! I could pin every pic...OK I will ;) Newest follower! All the chairs except the white one were from Pottery Barn a while back. Looks like you have a very homey kitchen Carlene. That's more important than having a "magazine perfect" home. One that's lived in and full of love are the best kind, and that's what I see when I look at your kitchen. Like you, I have a small collection of mini chairs and have thought about putting them on the walls. I wasn't sure how they would look, but I love them on your walls. I love all your reproductions too. My aunt used to have a large collection of jadeite before those things got so expensive. I've always loved how those pieces look, especially when you have more than one piece. Thanks for sharing your home on my party this week! I loved your shadow box from a previous post, but it's great to see it in your gorgeous kitchen - I love the vintage feel ! 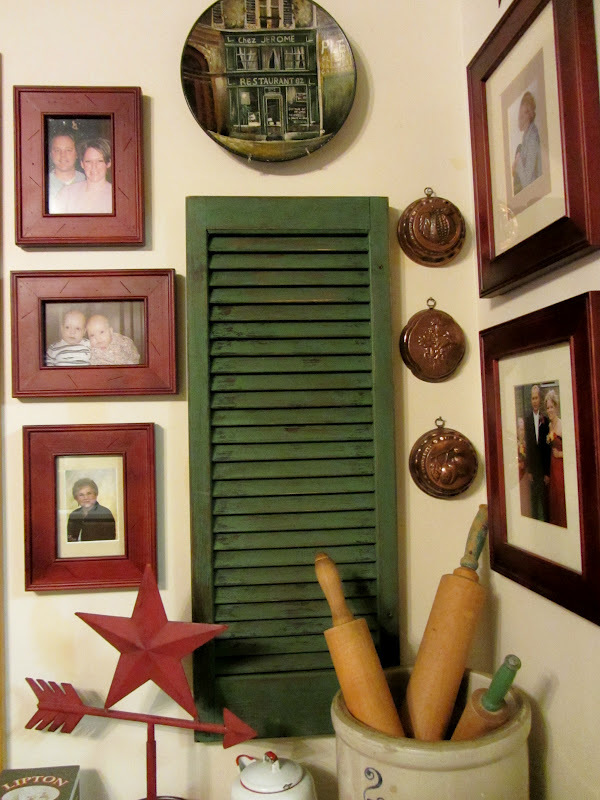 I love your red & green color palette and your burlap valance is so unique and creative! 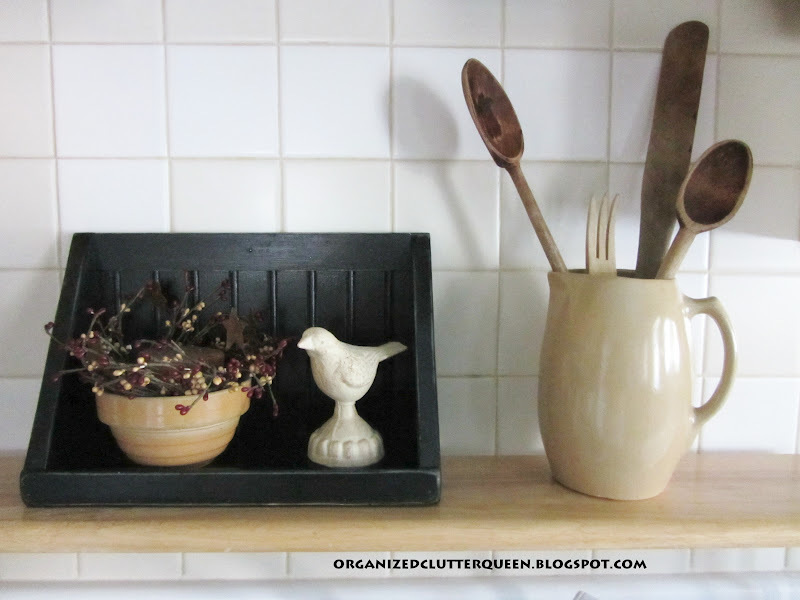 So much love & thought has gone into your kitchen... simply gorgeous! Hope you will visit Magnolia Cottage. I am your newest follower. Your Kitchen looks gorgeous really great, very homey and cozy looking! You know the heart of the home is the Kitchen. Your is full of love. Im your newest follower on your blog now. I hope you come join me also. Lovely and warm! I love all the special touches!!! It looks beautiful! Love that little chair collection. Thanks for linking up to Share the Love Wednesday--hope you'll be back this week! What a fun space! And I LOVE the little chairs on the wall! How cute are they!? PS Hope you're having a good week! 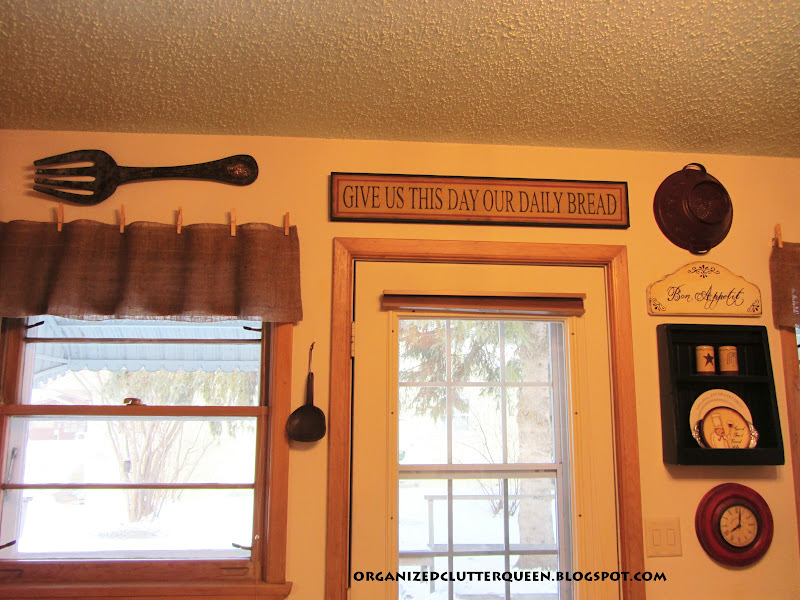 I love your kitchen, I love the amount of stuff you have on your walls! I am too a bit of a cluttered wall person, but I think if you have awesome stuff you should hang it to be seen! OLA CARLENE,SEU BLOG É MUITO INSPIRADOR,PARABÉNS.BOA SEMANA.BEIJO.